What is the Working Capital Formula? The working capital formula tells us the short-term, liquid assets remaining after short-term liabilities have been paid off. It is a measure of a company’s short-term liquidity and important for performing financial analysis, financial modelingWhat is Financial ModelingFinancial modeling is performed in Excel to forecast a company's financial performance. Overview of what is financial modeling, how & why to build a model. A 3 statement model links income statement, balance sheet, and cash flow statement. More advanced types of financial models are built for valuation, plannnig, and, and managing cash flowCash FlowCash Flow (CF) is the increase or decrease in the amount of money a business, institution, or individual has. In finance, the term is used to describe the amount of cash (currency) that is generated or consumed in a given time period. There are many types of CF. 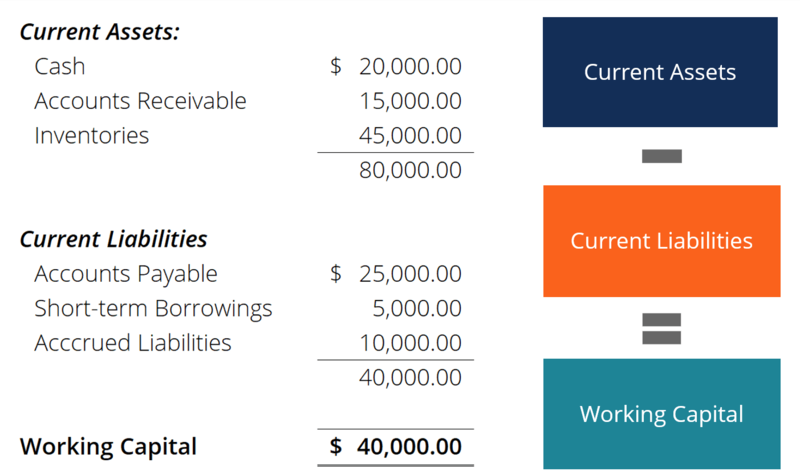 Below is an example balance sheet used to calculate working capital. As an example, a company can increase its working capital by selling more of its products. If the price per unit of the product is $1000 and cost per unit in inventoryInventoryInventory is a current asset account found on the balance sheet consisting of all raw materials, work-in-progress, and finished goods that a company has accumulated. It is often deemed the most illiquid of all current assets, and thus it is excluded from the numerator in the quick ratio calculation. is $600, the company’s working capital will increase by $400 for every unit, because either cash or accounts receivable will increase. Comparing the working capital of a company against its competitors in the same industry can demonstrate its competitive position. If Company A has working capital of $40,000 while Companies B and C have $15,000 and $10,000, respectively, Company A can spend more money to grow its business faster than its competitors. Working capital is the difference between a company’s current assets and current liabilitiesCurrent LiabilitiesCurrent liabilities are financial obligations of a business entity that are due and payable within a year. A company shows these on the balance sheet. A liability occurs when a company has undergone a transaction that has generated an expectation for a future outflow of cash or other economic resources.. It is a financial measure, which calculates whether a company has enough liquid assets to pay its bills that will be due in a year. When a company has excess current assets, that amount can then be used to spend on its day-to-day operations. Current assets, such as cash and equivalentsCash EquivalentsCash and cash equivalents are the most liquid of all assets on the balance sheet. Cash equivalents include money market securities, Bankers Acceptances, Treasury bills, commercial paper, and other money market instruments., inventory, accounts receivable and marketable securities, are resources a company owns that can be used up or converted into cash within a year. Current liabilities are the amount of money a company owes such as accounts payable, short-term loans and accrued expenses, which are due for payment within a year. Having positive working capital can be a good sign of the short-term financial health for a company because it has enough liquid assets remaining to pay off short-term bills and to internally finance the growth of their business. Without additional working capital, a company may have to borrow additional funds from a bank or turn to investment bankersValuationFree valuation guides to learn the most important concepts at your own pace. These articles will teach you business valuation best practices and how to value a company using comparable company analysis, discounted cash flow (DCF) modeling, and precedent transactions, as used in investment banking, equity research, to raise more money. Negative working capital means assets aren’t being used effectively, and a company may a liquidity crisis. Even if a company has lots invested in fixed assets, it will face financial challenges if liabilities come due too soon. This will lead to more borrowing, late payments to creditors and suppliers and, as a result, a lower corporate credit rating for the company. Depending on the type of business, companies can have negative working capital and still do well. Examples are grocery stores like Walmart or fast-food chains like McDonald’s that can generate cash very quickly due to high inventory turnover rates and by receiving payment from customers in a matter of a few days. These companies need little working capital. Products that are bought from suppliers are immediately sold to customers before the company even gets a chance to pays the vendor or supplier. In contrast, capital-intensive companies that manufacture heavy equipment and machinery usually can’t raise cash quickly, as they sell their products on a long-term payment basis. Since they can’t sell fast enough, cash won’t be available immediately during tough financial times, so having enough working capital is desirable. Learn more about a company’s Working Capital CycleWorking Capital CycleThe working capital cycle for a business is the length of time it takes to convert net working capital (current assets less current liabilities) all into cash. Businesses typically try to manage this cycle by selling inventory quickly,, and the timing of when cash comes in and out of the business. While the above formula and example are the most standard definition of working capital, there are other more focused definitions. We hope this guide on the working capital formula has been helpful. If you’d like more detail on how to calculate working capital in a financial model, please see our additional resources below.